Hood do you think you are? It’s been 25 years since Robin Hood: Prince of Thieves crashed onto UK cinema screens, and we all know that Kevin Costner and Errol Flynn donned tights and confounding archery trickery in the forests of Sherwood. Dean Newman picks a quiver full of people who have also brought the world’s most famous outlaw to life, including a duck and Cheggers! Following the same well drawn lines as his other alter ego Duck Dodgers, Daffy Duck, heads to Sherwood with fine support from Porky Pig as Friar Tuck. Directed by animation legend, Chuck Jones. The series was high concept to say the least: in the year 3000, a descendant of the original Robin Hood reforms the Merry Men, complete with namesakes of the originals, to combat a new Prince John, despotic ruler of the National Outer space Terrestrial Territories, and the Sheriff of N.O.T.T. (National Outer-Space Terrestrial Territories). While the bow and arrow was still Robin’s weapon of choice, almost everything else was updated. He now had rayguns, electro-quarter staves and rocket ships at his disposal…and jet-packs! Think Space Ghost style animation meets the original animated Spiderman. Cheggers plays pop-ular action folk hero in his Children’s Film Foundation classic (think the Robin Hood version of Bugsy Malone minus those custard pie guns and all that singing). A fantastically fun romp that deserves to be released on DVD with Keith Chegwin commentary! Talking of Bond…one of the few Robin Hood’s to die on screen and indeed to show him in his twilight years. Slower paced and had a fantastic Guy of Gisbourne in the shape of Robert Shaw. Acting, of course, runs in the family and Jason got to step up to the plate in the third series of Robin of Sherwood as Robert of Huntingdon. There’s more than a bonkers feel to this Terry Gilliam film fest with Python face as perhaps the oddest choice big screen aloof Hood ever, in charge of some perhaps too Merry Men. For me this was as much a part of early 80s Saturday teatime as Doctor Who. Still looks great nearly 30 years later and features a fantastic turn from Ray Winstone as the screens greatest ever Will Scarlet. 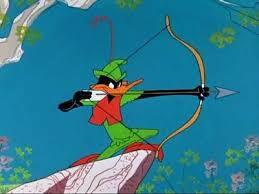 Had a brilliant two-part opener that fused together would have made one of the best Robin Hood films ever! Famously full of mysticism, it was the first Robin Hood to take in the notion of the green man and introduce us to Herne the Hunter. It was also the first to introduce a Saracen character from the Crusades that has now – with Prince of Thieves and the recent BBC TV series – become the norm. Praed bowed out after series two, succumbing to the Sheriff and his men, or in TV terms, moved to America to only be shot at his own wedding in Dynasty, surely the Hood equivalent of George Lazenby jacking in Bond after one film. Interesting fact: Neil Morrissey, from Men Behaving Badly and Boon, almost got to play the Hooded Man. It’s in one of those dastardly Q moments that expertly lampoons the look and feel of Flynn’s Adventures of Robin Hood, albeit with a Klingon and an android, it also some brilliant knowing dialogue. Stewart also parodied the Sean Connery role in Prince of Thieves, complete with strong Scottish accent, at the close of Men in Tights. The ‘other’ Robin Hood of 1991, this Irishman played Robin Hood with a tache in what was released as a TV movie in America but theatrically over here in Blightly. Billed as gritty, it certainly rhymed with that, as it added elements into the mix that were just downright odd/dull. Uma Thurman made an interesting Maid Marian however. Not a lot really happens. “Unlike other Robin Hoods I speak with an English accent.” Cary Elwes showed he was good with a blade in The Princess Bride and actually would have made an impressive bonafide Hooded Man. Was actually born in England, which is something of a rarity for big screen Robin Hoods in Hollywood. Certainly not Mel Brook’s greatest film ever but has aged well and still manages to raise more than a titter. One of those oh so special programmes produced for the millennium, indeed it was produced to be shown at The Dome, which generally means they miss the mark more than they hit with a parade of famous people trying to be oh so funny, also see Comic Relief specials etc, in the days before Extras. Blackadder’s very own Lord Flash heart managed to stuff himself in his tights and brought along Kate Moss as Maid Marian. Beware, not as good as the original series. Close, but no cigar, Darling. Before playing with Pirates this young moppet played Robin Hood’s daughter in this little seen Disney TV movie which also saw Malcolm McDowell as the scowling Sheriff. Directed by Peter Hewitt, who helmed both Bill and Ted’s Bogus Journey and The Borrowers.